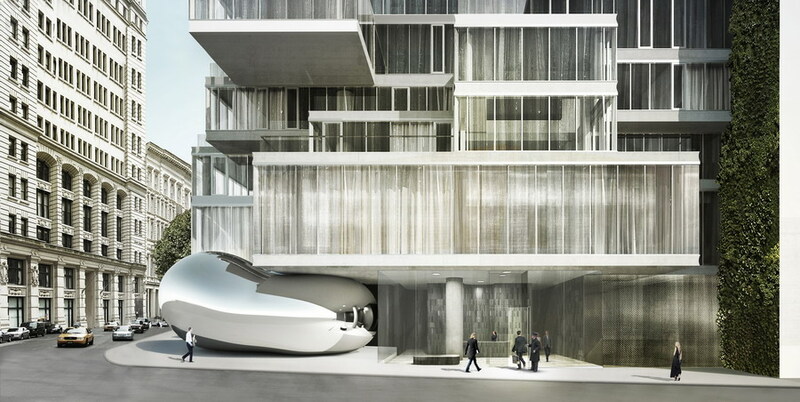 Tronic Studio tapped into their architecture backgrounds for the film they created for Herzog & de Meuron’s 57-story hi-rise residential tower in Tribeca. Combining a live action helicopter shoot with extensive CG modeling, the film shows the poetic beauty of how the building was conceived, beginning with the elements of each floor descending from the Manhattan sky and landing into place on top of the Anish Kapoor sculpture. Fully integrated into the architecture itself as if to say that culture and the city are indivisible, Kapoor’s massive, reflective stainless steel piece – an enigmatic balloon-like form that appears to be combating compression from above – will be a new cultural landmark in Tribeca and the artist’s first permanent public work in New York City. Tronic is a NYC based directing, design and animation studio founded in 2001 by Columbia Architecture graduates Jesse Seppi and Vivian Rosenthal. They’ve directed and animated spots for Target, Adidas, Microsoft and Sony, designed and executed installations and new media campaigns for Diesel, GE, Nike, Sharp and Hitachi, and in general, have worked to eliminate lines delineating one form of creative media output from another. These visual futurists are boldly combining architecture, new media, animation and branding through new uses of technology to create visually striking and conceptually based work. Tronic also directed and animated the spot below on the loss of nature in our increasingly man-made landscape. I AM shows a bleak future, where animals, now a recent memory, are constructed from detritus. This is their plea to us. I AM from TronicStudio on Vimeo.